Inspire, motivate or share some humor with the perfect quote graphic to go on your blog or social media. With its marriage of imagery and words that can be wise, inspirational or funny at turns, it’s no wonder that quote graphics are one of the most highly shared post types in social media. They generate engagement and can work on every platform, from Facebook to Twitter, Pinterest and Instagram. Whether you’re working on a digital marketing campaign or simply want to share your art and passion for words online, Canva helps you to easily and quickly create eye-catching quote graphics. Explore Canva’s amazing library of stock images and illustrations, add your text and create some beautiful typography, then share your new design straight to your followers. Create an amazing quote graphic in under 5 minutes! Open Canva and select the “Social Media Graphic” design type. Canva’s image library hosts an impressive collection of over a million stock images, illustrations and graphics. From beautiful landscapes to mouthwatering food photography, search for exactly the right imagery to go with your quote. Many are free while premium elements are only $1 for each one-time use. Want to use your own photography? Simply upload your chosen image then drag and drop it into your design. Add enhancements like filters or effects like X-process and vignette or play around with settings like brightness, contrast and hue until you’ve got the perfect background image for your quote graphic. There are over a hundred fonts types to choose from in Canva. Pair two to three contrasting weights and styles or stick to one that represents the mood of your graphic. Canva also has ready-made text holders that you can simply choose from and edit. Take your pick of over a hundred expertly-designed quote graphic templates, created by our amazing team of designers. 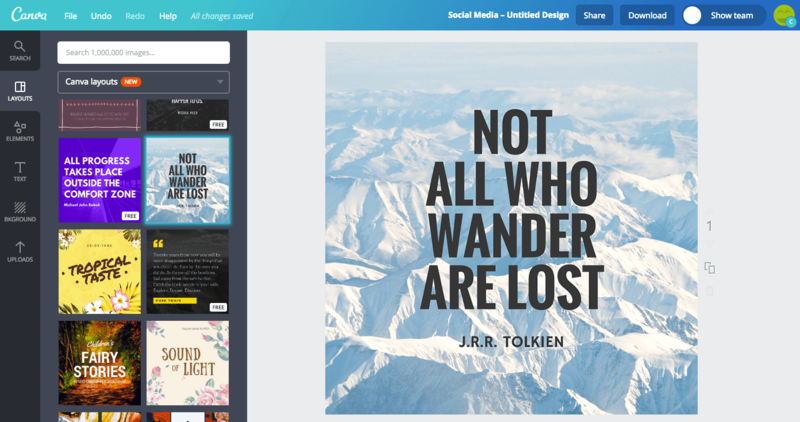 Whether you want to share your quote on Facebook, Twitter, Pinterest or Instagram, Canva has layouts optimized for each platform. Or, you can always use custom dimensions to create your post. Canva for Work subscribers have access to the Magic Resize feature which instantly converts one design to different, optimized sizes with one click. Whether you’re designing on the web or using our free apps for your iOS or Android devices, Canva makes creating and sharing quote graphics easy. Once you’re happy with your new design, just click on the “Share” button to post your design straight to Facebook, LinkedIn or Twitter. You can always download your design, too, as a JPEG, high-res PNG or PDF file.